JEE Advanced 2018 Answer Key by Aakash Institute has been released by the coaching institute which has been provided on this page. The JEE Advanced Answer Key 2018 by Aakash Institute has been made available in PDF and the same can be downloaded here from this page. The JEE Advanced 2018 exam was conducted by IIT Kanpur on 20 May 2018. The official answer key of JEE Advanced 2018 will be released by the exam conducting authority on 29 May 2018. The candidates can download the JEE Advanced 2018 Answer Key by Aakash Institute. The JEE Advanced 2018 Answer Key by Aakash Institute facilitates the candidates to compare their answers with the keys and thus know their probable marks in the exam. To calculate the probable scores through the answer key of JEE Advanced 2018 by Aakash Institute, the official marking scheme has to be used by the candidates. Joint Entrance Examination (JEE) is a common entrance exam organised by the Indian Institute of Technology that opens a gateway to seek admission in various engineering colleges throughout India. To get the complete details of JEE Advanced 2018 Answer Key by Aakash Institute, candidates should read this article thoroughly. All the candidates who appeared for the JEE Advanced Exam 2018 on 20 would like to calculate their estimated scores in both the papers. The official Answer Key of JEE Advanced 2018 will be released by the exam conducting authority i.e. IIT Kanpur after a week of the exam. The JEE Advanced 2018 Result will be announced in June 2018. The JEE Advanced 2018 Answer Key by Aakash Institute experts will be helpful to the students by providing the correct answers to the aspirants. Besides, they can estimate their scores in the JEE Advanced 2018 Exam. 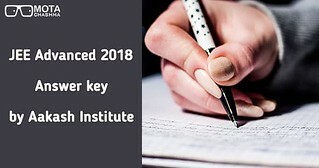 The JEE Advanced 2018 Answer Key by Aakash Institute will comprise the efforts of the experts of the coaching institute. In order to be able to calculate the more accurate probable score, the candidates must remember their responses in the answer sheets at the examination hall. The scores resulted by using the Answer Key of JEE Advanced 2018 by Aakash Institute will be analytic in nature.